You can set the Maximum (inclusive) and Minimum (exclusive) scale, defining a range of scale in which features will be visible. Out of this range, they are hidden. The Set to current canvas scale button helps you use the current map canvas scale as boundary of the range visibility. The Query Builder is accessible through the eponym term at the bottom of the General menu in the Layer Properties. Under Feature subset, click on the [Query Builder] button to open the Query builder. 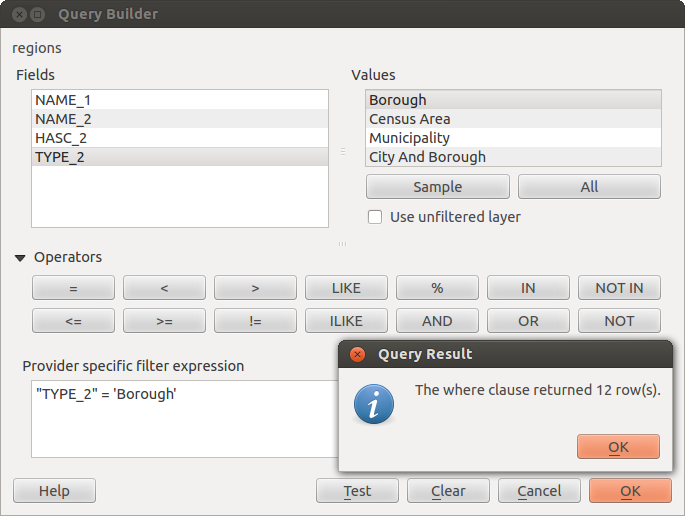 For example, if you have a regions layer with a TYPE_2 field, you could select only regions that are borough in the Provider specific filter expression box of the Query Builder. 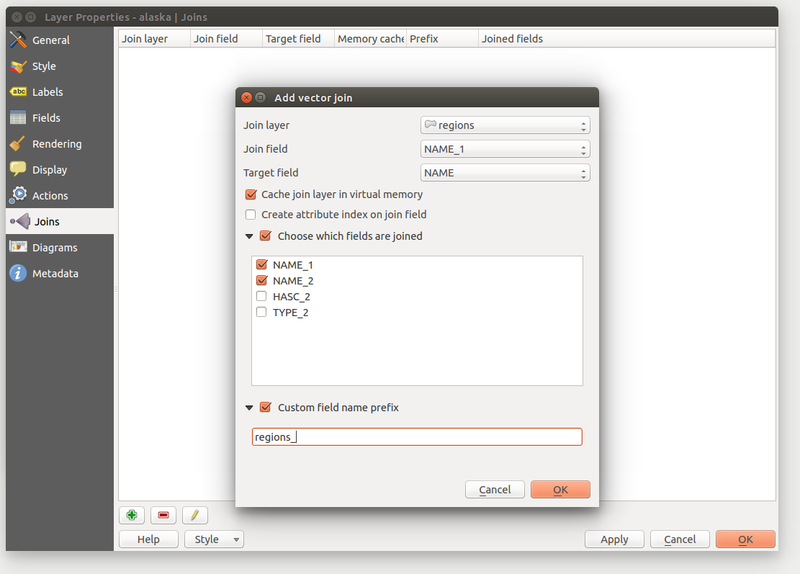 Figure_vector_general_2 shows an example of the Query Builder populated with the regions.shp layer from the QGIS sample data. The Fields, Values and Operators sections help you to construct the SQL-like query. 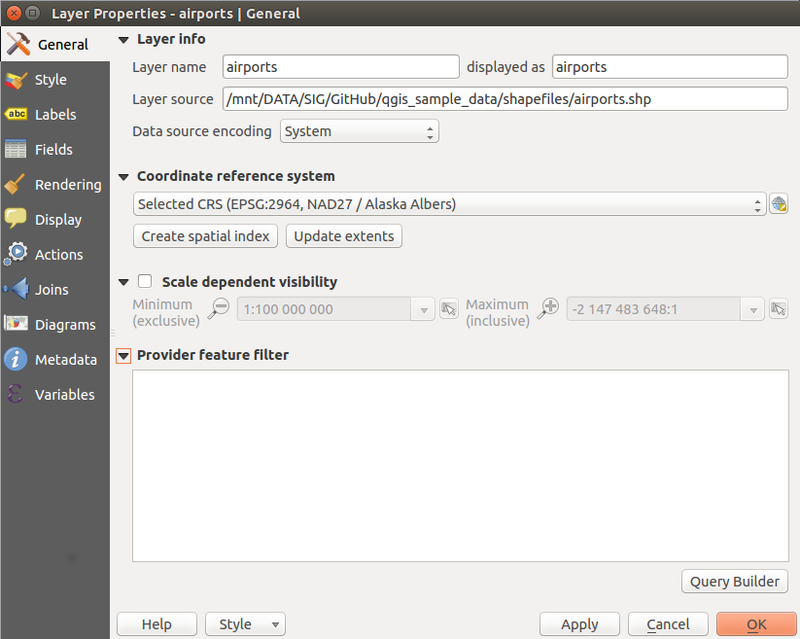 QGIS treats the resulting subset acts as if it where the entire layer. For example if you applied the filter above for ‘Borough’, you can not display, query, save or edit Anchorage, because that is a ‘Municipality’ and therefore not part of the subset. The Style menu provides you with a comprehensive tool for rendering and symbolizing your vector data. You can use tools that are common to all vector data, as well as special symbolizing tools that were designed for the different kinds of vector data. However all types share the following dialog structure: in the upper part, you have a widget that helps you prepare the classification and the symbol to use for features and at the bottom the Layer rendering widget. The renderer is responsible for drawing a feature together with the correct symbol. Regardless layer geometry type, there are four common types of renderers: single symbol, categorized, graduated and rule-based. For point layers, there are a point displacement and a heatmap renderers available while polygon layers can also be rendered with the inverted renderer. 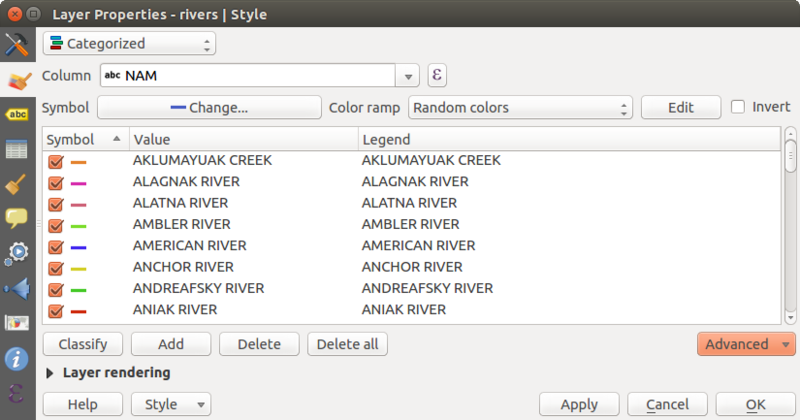 The example in figure_symbology_2 shows the category rendering dialog used for the rivers layer of the QGIS sample dataset. 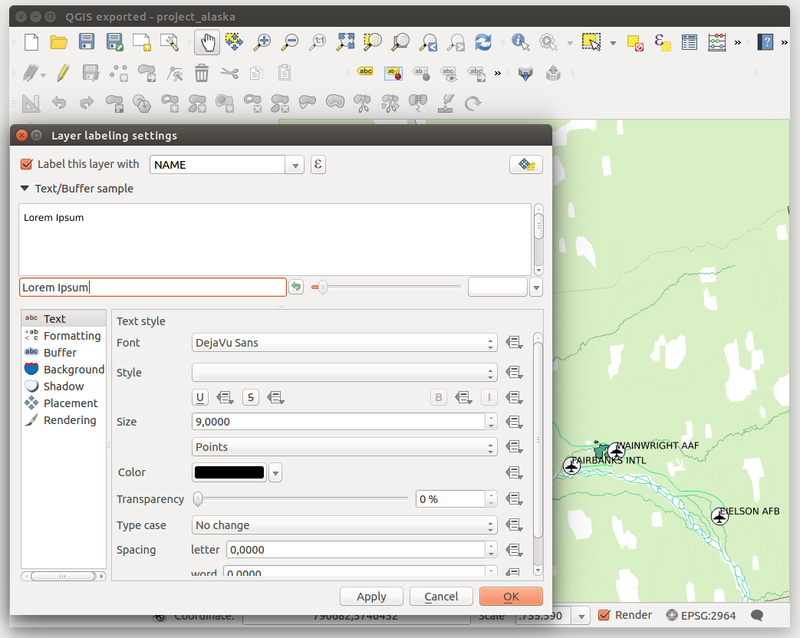 The example in figure_symbology_3 shows the graduated rendering dialog for the rivers layer of the QGIS sample dataset. Proportional rendering is done by first applying to the layer the Single Symbol Renderer. 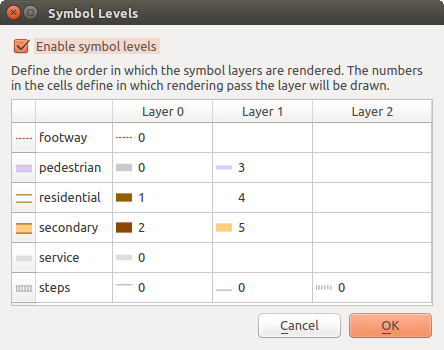 Once you set the symbol, at the upper level of the symbol tree, the Data-defined override button available beside Size or Width options (for point or line layers respectively) provides tool to create proportional symbology for the layer. An assistant is moreover accessible through the menu to help you define size expression. 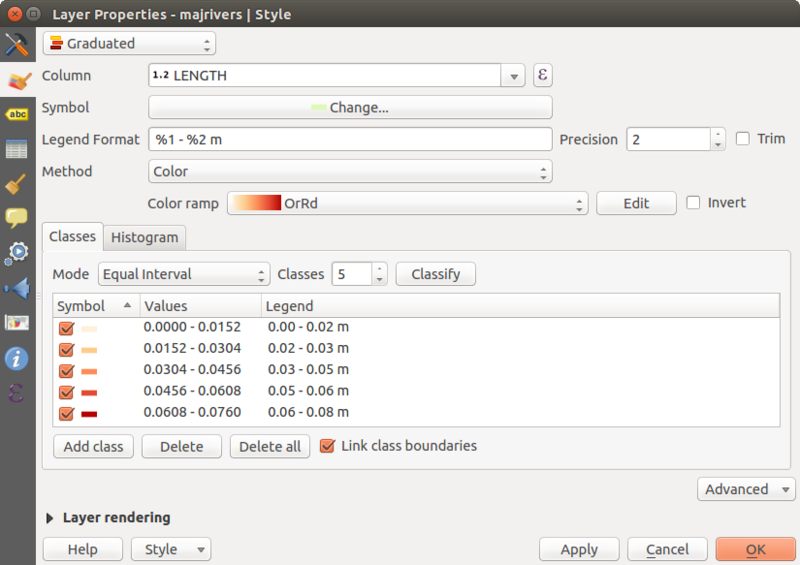 The simplest way to create multivariate analysis in QGIS is to first apply a categorized or graduated rendering on a layer, using the same type of symbol for all the classes. Then, clicking on the symbol [Change] button above the classification frame, you get the The symbol Selector dialog from which, as seen above, you can activate and set the size assistant option either on size (for point layer) or width (for line layer). To create a rule, activate an existing row by double-clicking on it, or click on ‘+’ and click on the new rule. In the Rule properties dialog, you can define a label for the rule. Press the button to open the expression string builder. In the Function List, click on Fields and Values to view all attributes of the attribute table to be searched. To add an attribute to the field calculator Expression field, double click on its name in the Fields and Values list. Generally, you can use the various fields, values and functions to construct the calculation expression, or you can just type it into the box (see Expressions). You can create a new rule by copying and pasting an existing rule with the right mouse button. You can also use the ‘ELSE’ rule that will be run if none of the other rules on that level matches. Since QGIS 2.8 the rules appear in a tree hierarchy in the map legend. 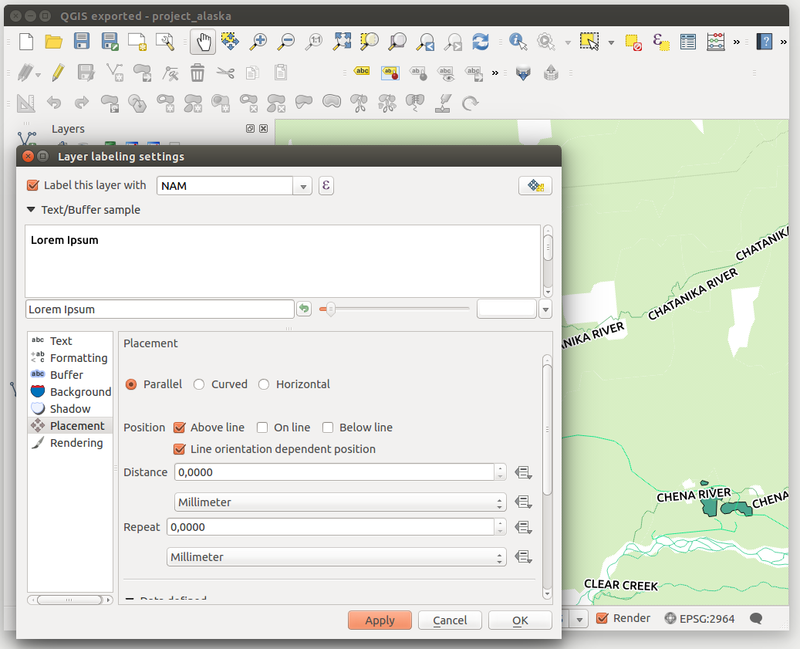 Just double-click the rules in the map legend and the Style menu of the layer properties appears showing the rule that is the background for the symbol in the tree. 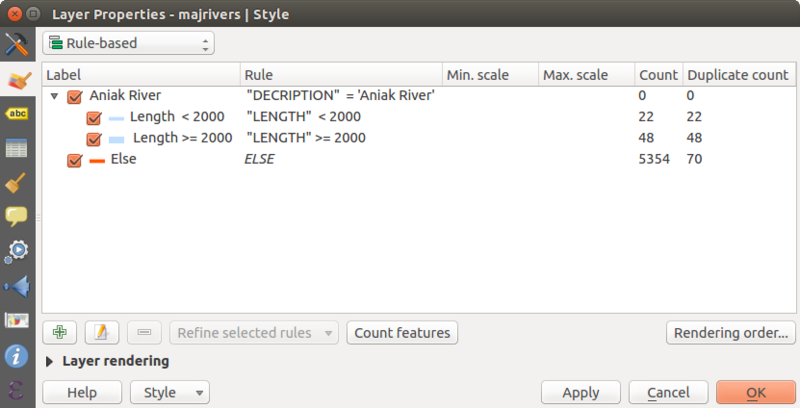 The example in figure_symbology_5 shows the rule-based rendering dialog for the rivers layer of the QGIS sample dataset. The Inverted Polygon renderer allows user to define a symbol to fill in outside of the layer’s polygons. As above you can select subrenderers, namely Single symbol, Graduated, Categorized, Rule-Based or 2.5 D renderer. Using the 2.5 D renderer it’s possible to create a 2.5 D effect on your layer’s features. You start by choosing a Height value (in map units). For that you can use a fixed value, one of your layer’s fields, or an expression. You also need to choose an Angle (in degrees) to recreate the viewer position (0° means west, growing in counter clock wise). Use advanced configuration options to set the Roof Color and Wall Color. 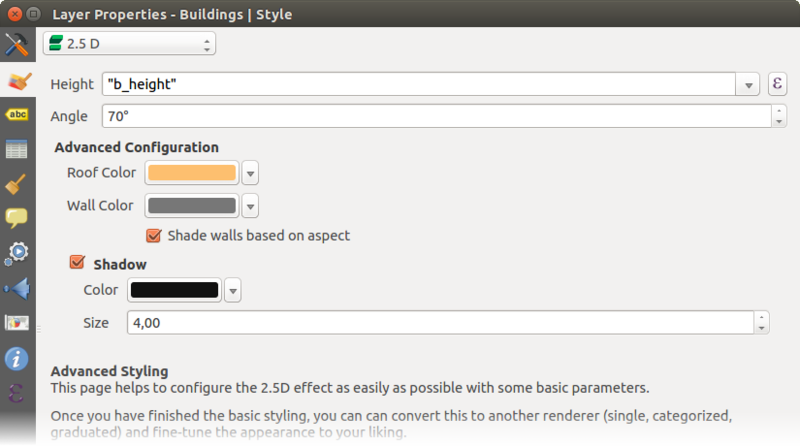 If you would like to simulate solar radiation on the features walls, make sure to check the Shade walls based on aspect option. 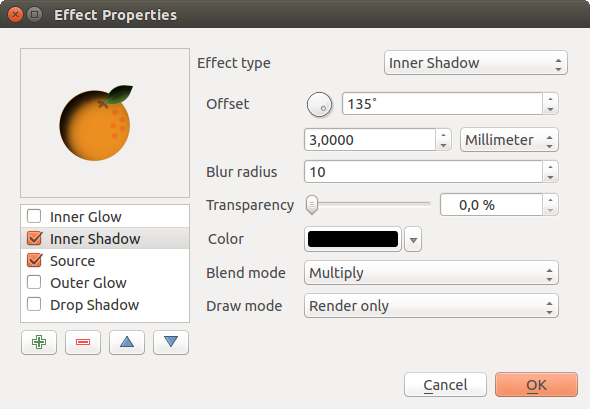 You can also simulate a shadow by setting a Color and Size (in map units). Once you have finished setting the basic style on the 2.5 D renderer, you can convert this to another renderer (single, categorized, graduated). The 2.5 D effects will be kept and all other renderer specific options will be available for you to fine tune them (this way you can have for example categorized symbols with a nice 2.5 D representation or add some extra styling to your 2.5 D symbols). To make sure that the shadow and the “building” itself do not interfere with other nearby features, you may need to enable Symbols Levels ( Advanced ‣ Symbol levels...). The 2.5 D height and angle values are saved in the layer’s variables, so you can edit it afterwards in the variables tab of the layer’s properties dialog. 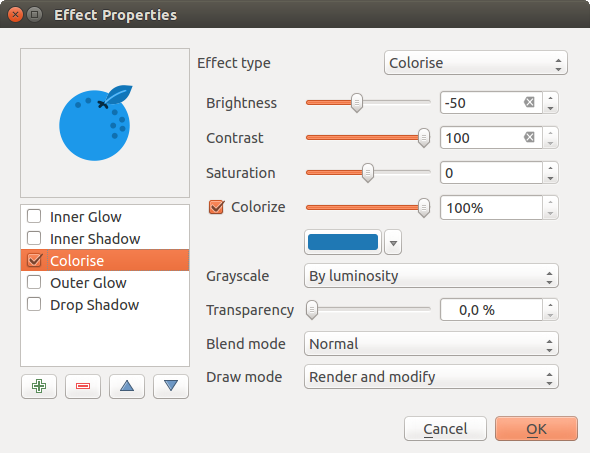 Layer blending mode and Feature blending mode: You can achieve special rendering effects with these tools that you may previously only know from graphics programs. The pixels of your overlaying and underlaying layers are mixed through the settings described in Blending Modes. Once the Define Order dialog is applied, a summary of the expression(s) used to control the layer rendering is retranscribed in the textbox beside Control feature rendering order option. For most of the renderers, you can access the Symbols levels option by clicking the [Advanced] button below the saved symbols list and choosing Symbol levels. 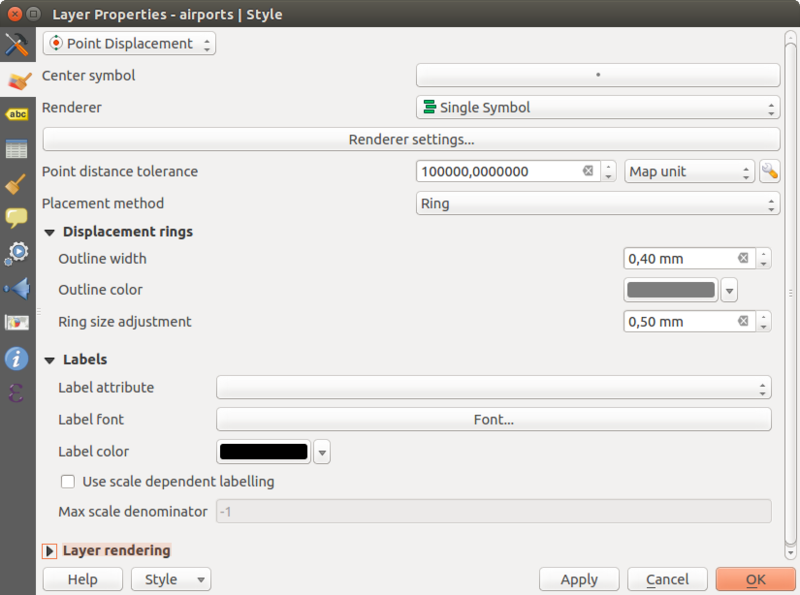 For the Rule-based rendering the option is directly available through [Symbols levels] button, while for Point displacement renderer the same button is inside the Rendering settings dialog. There are some common options available for all draw effect types. 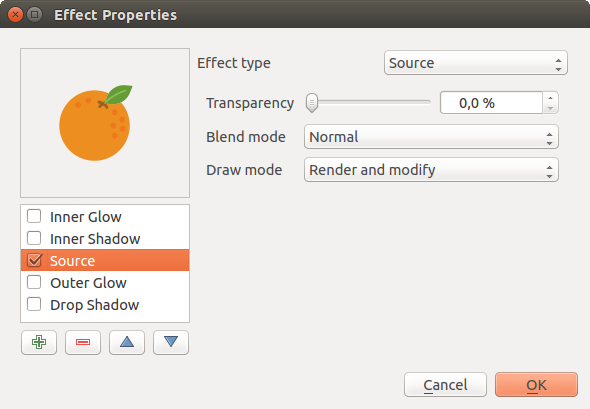 Transparency and Blend mode options work similar to the ones described in Layer rendering and can be used in all draw effects except for the transform one. 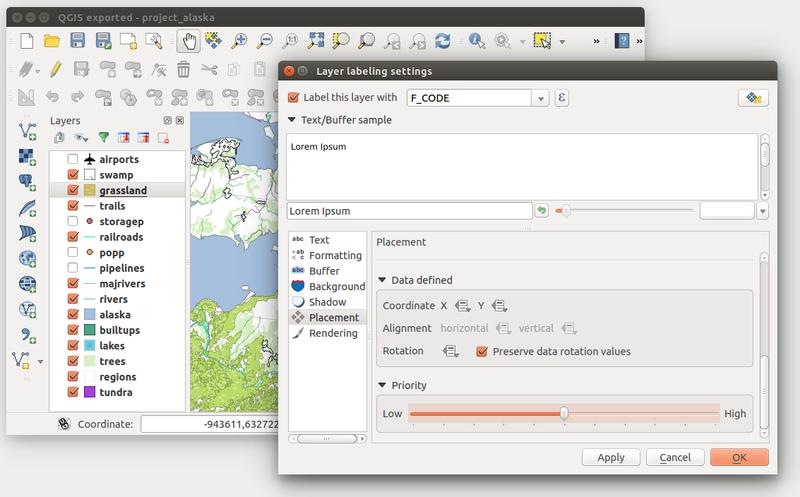 To label a layer start QGIS and load a vector layer. 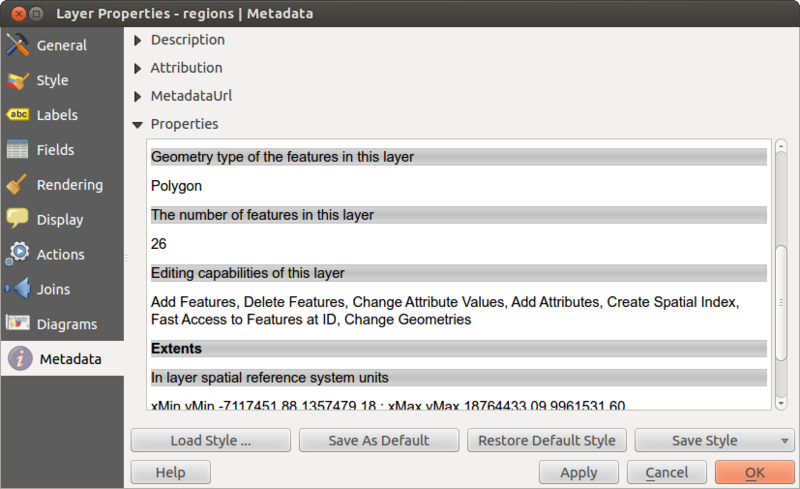 Activate the layer in the legend and click on the Layer Labeling Options icon in the QGIS toolbar menu or activate the Labels tab in the layer properties dialog. and Discourage other labels from covering features in this layer: allows to set a layer as just an obstacle for other layer’s labels without rendering any labels of its own. Select the Show labels for this layer option and then select an attribute column to use for labeling from the Label with drop-down list. Click if you want to define labels based on expressions - See Define labels based on expressions. The following steps describe simple labeling without using the Data defined override functions, which are situated next to the drop-down menus - see Using data-defined override for labeling for an use-case. 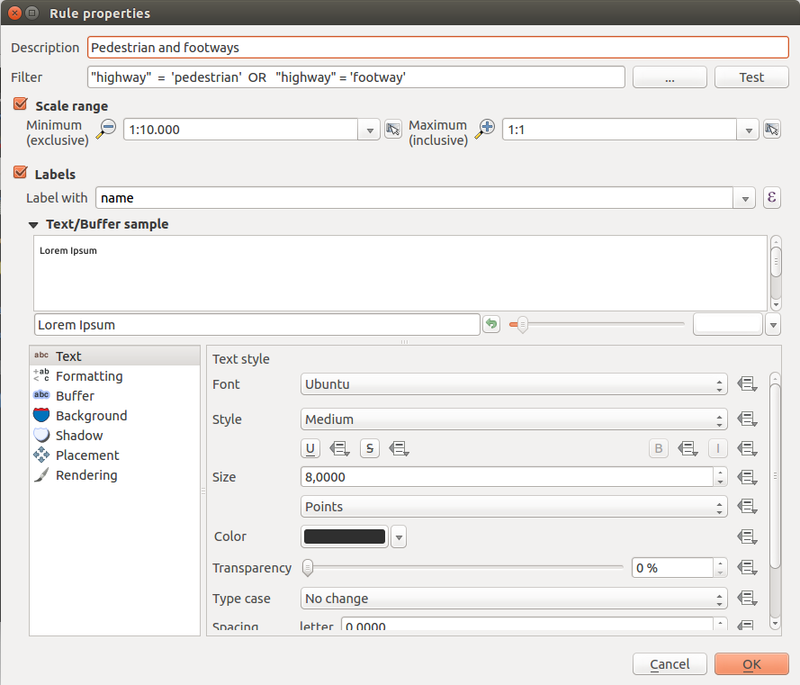 You can define the text style in the Text menu (see Figure_labels_1). Use the Type case option to influence the text rendering. You have the possibility to render the text ‘All uppercase’, ‘All lowercase’ or ‘Capitalize first letter’. Use the Blending Modes to create effects known from graphics programs. In the Formatting menu, you can define a character for a line break in the labels with the ‘Wrap on character’ function. You can format the Line Height and the alignment. For the latter typical values are available plus Follow label placement. When set to this mode, text alignment for labels will be dependent on the final placement of the label relative to the point. E.g., if the label is placed to the left of the point then the label will be right aligned, and if it is placed to the right of the point then the label will be left aligned. For line vector layers you can include line directions symbols. There are options specifying the type of symbol and the symbol placement. Use the Formatted numbers option to format the numbers in an attribute table. Here, decimal places may be inserted. If you enable this option, three decimal places are initially set by default. 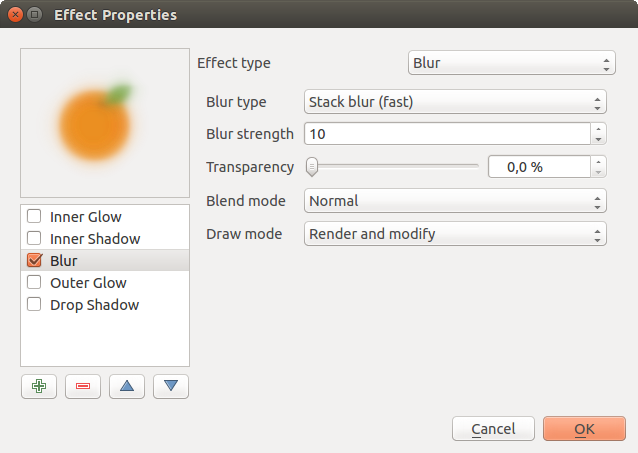 To create a buffer, just activate the Draw text buffer checkbox in the Buffer menu. The buffer color is variable. 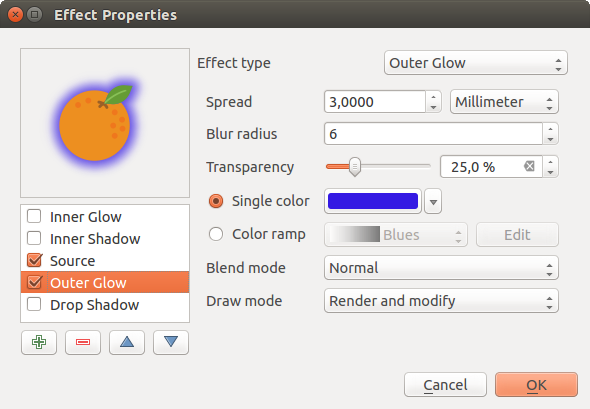 Here, you can also use blend modes. If the color buffer’s fill checkbox is activated, it will interact with partially transparent text and give mixed color transparency results. Turning off the buffer fill fixes that issue (except where the interior aspect of the buffer’s stroke intersects with the text’s fill) and also allows you to make outlined text. 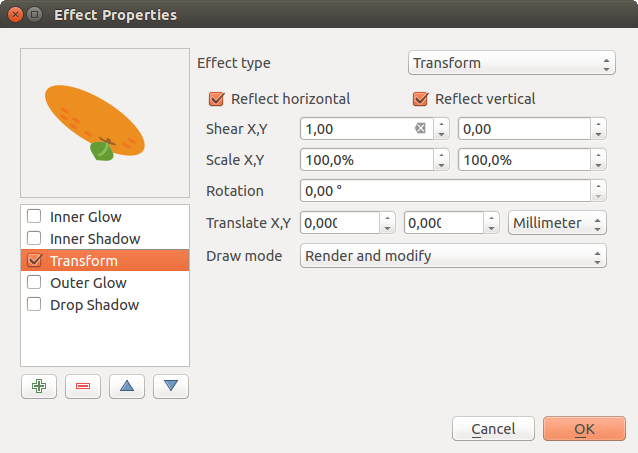 In the Background menu, you can define with Size X and Size Y the shape of your background. Use Size type to insert an additional ‘Buffer’ into your background. The buffer size is set by default here. The background then consists of the buffer plus the background in Size X and Size Y. You can set a Rotation where you can choose between ‘Sync with label’, ‘Offset of label’ and ‘Fixed’. Using ‘Offset of label’ and ‘Fixed’, you can rotate the background. Define an Offset X,Y with X and Y values, and the background will be shifted. When applying Radius X,Y, the background gets rounded corners. Again, it is possible to mix the background with the underlying layers in the map canvas using the Blend mode (see Blending Modes). 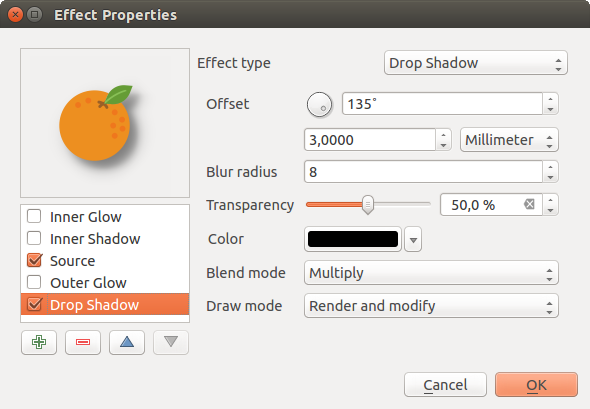 Use the Shadow menu for a user-defined Drop shadow. The drawing of the background is very variable. Choose between ‘Lowest label component’, ‘Text’, ‘Buffer’ and ‘Background’. The Offset angle depends on the orientation of the label. If you choose the Use global shadow checkbox, then the zero point of the angle is always oriented to the north and doesn’t depend on the orientation of the label. You can influence the appearance of the shadow with the Blur radius. The higher the number, the softer the shadows. The appearance of the drop shadow can also be altered by choosing a blend mode. Choose the Placement menu for configuring label placement and labeling priority. Note that the placement options differ according to the type of vector layer, namely point, line or polygon. 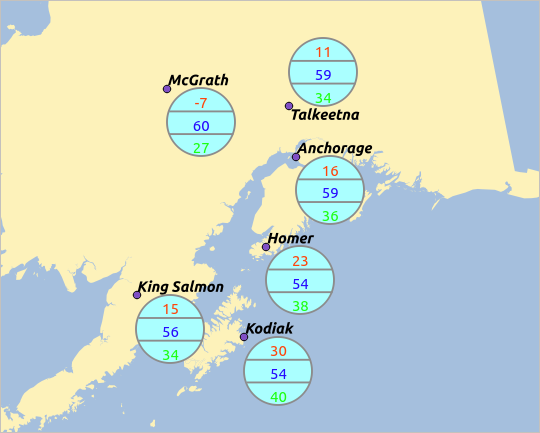 With the Cartographic placement mode, point labels are generated with best visual relationship with the point feature, following ideal cartographic placement rules. Labels can be placed at a set Distance either from the point feature itself or from the bounds of the symbol used to represent the feature. The latter option is especially useful when the symbol size isn’t fixed, e.g. if it’s set by a data defined size or when using different symbols in a categorized renderer. Placement priority can however be customized or set for an individual feature using a data defined list of prioritised positions. This also allows only certain placements to be used, so e.g. for coastal features you can prevent labels being placed over the land. In the Offset from point placement, labels are placed at a fixed offset from the point feature. You can select the Quadrant in which to place your label. You are also able to set the X and Y offset distances between the points and their labels and can alter the angle of the label placement with the Rotation setting. Thus, placement in a selected quadrant with a defined rotation is possible. Label options for line layers include Parallel, Curved or Horizontal. For the Parallel and Curved options, you can set the position to Above line, On line and Below line. It’s possible to select several options at once. 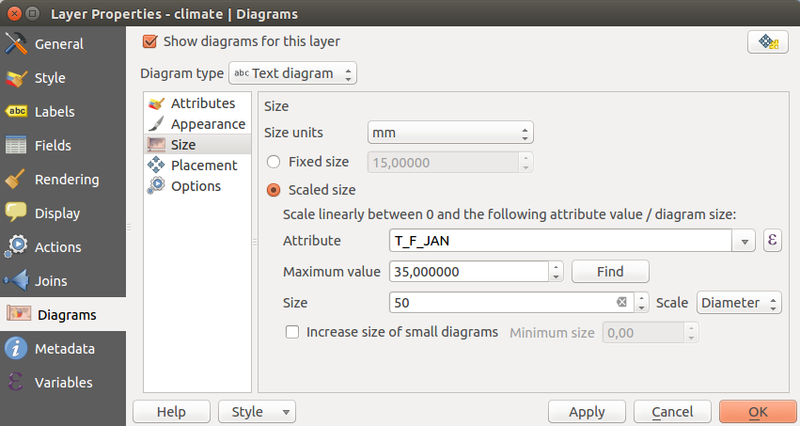 In that case, QGIS will look for the optimal label position. For Parallel and curved placement you can also use the line orientation for the position of the label. Additionally, you can define a Maximum angle between curved characters when selecting the Curved option (see Figure_labels_2 ). For all three placement options you can set up a minimum distance for repeating labels. The distance can be in mm or in map units. You can choose one of the following options for placing labels in polygons: Offset from centroid, Horizontal (slow), Around centroid, Free and Using perimeter. In the Offset from centroid settings you can specify if the centroid is of the visible polygon or whole polygon. That means that either the centroid is used for the polygon you can see on the map or the centroid is determined for the whole polygon, no matter if you can see the whole feature on the map. You can place your label within a specific quadrant, and define offset and rotation. The Around centroid setting places the label at a specified distance around the centroid. Again, you can define visible polygon or whole polygon for the centroid. With the Using perimeter settings, you can define a position and a distance for the label. For the position, Above line, On line, Below line and Line orientation dependent position are possible. You can specify the distance between the label and the polygon outline, as well as the repeat interval for the label. In the priority section you can define the priority with which labels are rendered for all three vector layer types (point, line, polygon). This placement option interact with labels of the other vector layers in the map canvas. If there are labels from different layers in the same location, the label with the higher priority will be displayed and the others will be left out. In the Rendering menu, you can tune when the labels can be rendered and their interaction with other labels and features. or over the feature’s boundary: avoids placing labels over boundary of polygon (prefers placing labels outside or completely inside the polygon). It can be e.g. useful for regional boundary layers, where the features cover an entire area. In this case it’s impossible to avoid placing labels within these features, and it looks much better to avoid placing them over the boundaries between features. 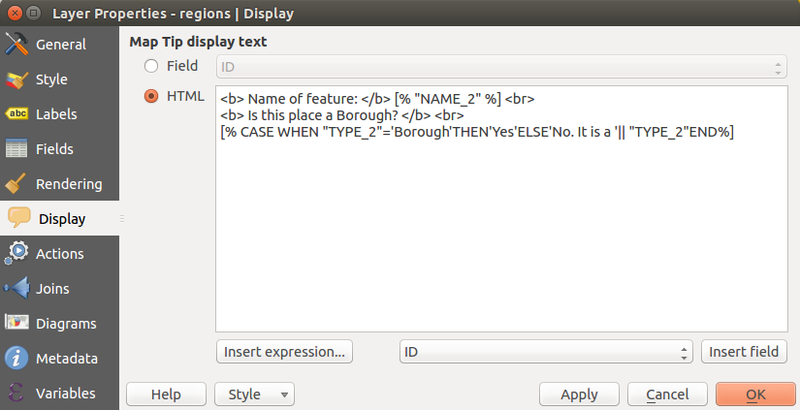 QGIS allows to use expressions to label features. Just click the icon in the Labels menu of the properties dialog. 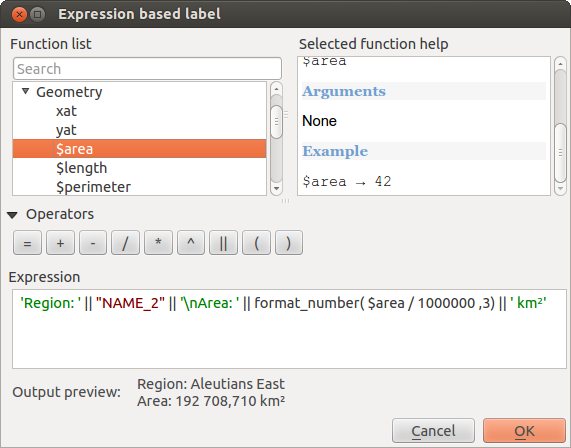 In figure_labels_4 you see a sample expression to label the alaska regions with name and area size, based on the field ‘NAME_2’, some descriptive text and the function $area in combination with format_number() to make it look nicer. # to show the place name and its rounded area size in a converted unit. Go to the Label toolbar and click the icon. Now you can shift the label manually to another position (see figure_labels_6). The new position of the label is saved in the ‘xlabel’ and ‘ylabel’ columns of the attribute table. With Rule-based labeling multiple label configurations can be defined and applied selectively on the base of expression filters, as in Rule-based rendering. Rules can be set selecting the corresponding option at the top of the Labels panel (see figure_labels_7 ). To create a rule, activate an existing row by double-clicking on it, or click on ‘+’ and click on the new rule. Within the panel you can set the filter expression and the related label configurations. Relation Reference: This widget lets you embed the feature form of the referenced layer on the feature form of the actual layer. See Creating one to many relations. If the path which is selected with the file browser is located in the same directory as the .qgs project file or below, paths are converted to relative paths. This increases portability of a qgs project with multimedia information attached. This is enabled only for File Name, Photo and Web View at this moment. With the Attribute editor layout, you can now define built-in forms (see figure_fields_2). This is useful for data entry jobs or to identify objects using the option auto open form when you have objects with many attributes. 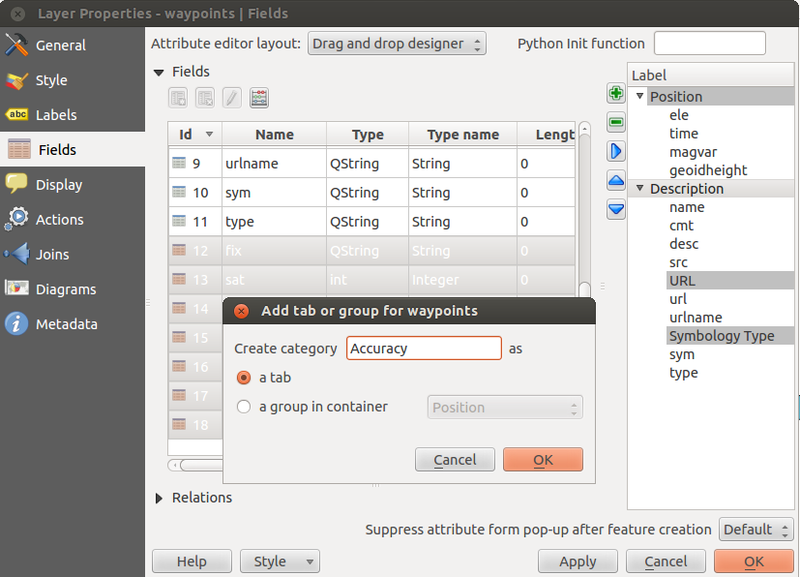 You can create an editor with several tabs and named groups to present the attribute fields. In all cases you must enter the name of the function that will be called ( open in the example below). You can move up and down any row with click and drag, sorting how atributes are displayed. You can also change the label in the ‘Legend’ column or the attibute color by double-clicking the item. Given that almost all the settings above are common to the different types of diagram, when designing your diagram, you can easily change the diagram type and check which one is more appropriate to your data without any loss. Click on the Diagrams menu, activate Show diagrams for this layer, and from the Diagram type combo box, select ‘Text diagram’. Change the attribute colors by double clicking on the color values in the Assigned attributes field. Figure_diagrams_3 gives an idea of the result. This menu is specifically created for Map Tips. 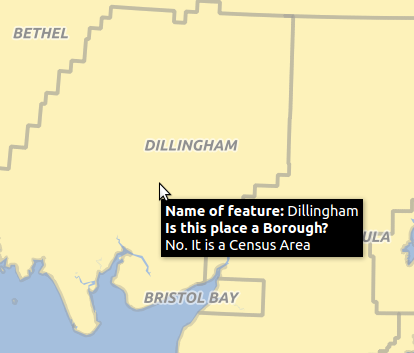 It includes a nice feature: Map Tip display text in HTML. While you can still choose a Field to be displayed when hovering over a feature on the map, it is also possible to insert HTML code that creates a complex display when hovering over a feature. To activate Map Tips, select the menu option View ‣ Map Tips. Figure Display 1 and 2 show an example of HTML code and how it behaves in map canvas. 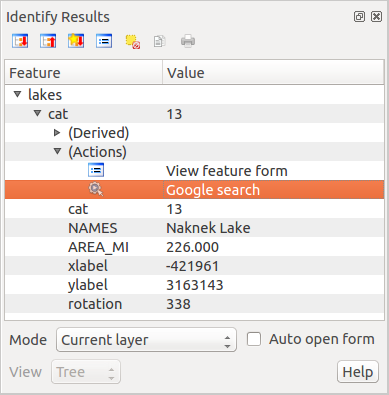 QGIS offers support for on-the-fly feature generalisation. This can improve rendering times when drawing many complex features at small scales. This feature can be enabled or disabled in the layer settings using the Simplify geometry option. There is also a global setting that enables generalisation by default for newly added layers (see section Options). 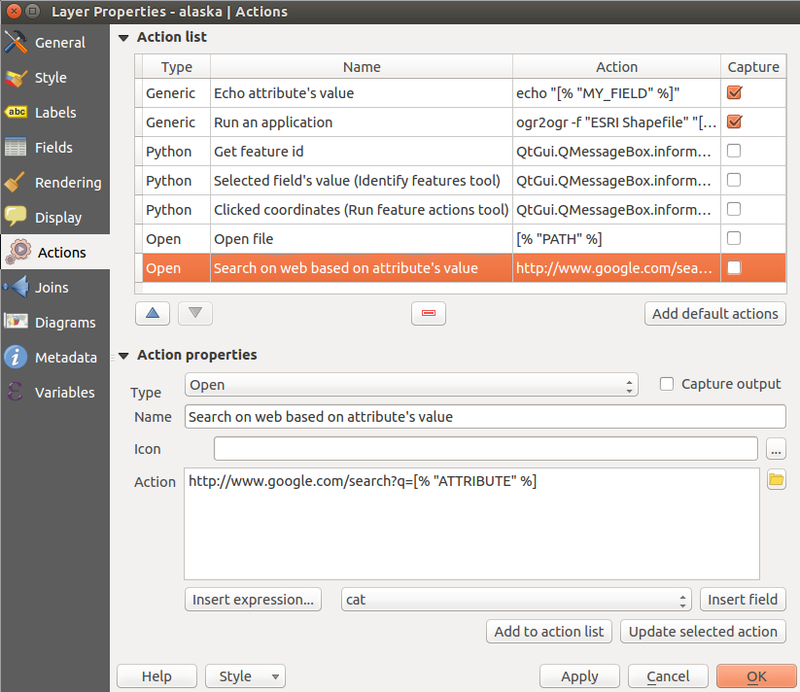 The Metadata menu consists of Description, Attribution, MetadataURL, LegendUrl and Properties sections. Additionally, you can add or edit a title and abstract for the layer in the Description section. It’s also possible to define a Keyword list here. These keyword lists can be used in a metadata catalogue. If you want to use a title from an XML metadata file, you have to fill in a link in the DataUrl field. Use Attribution to get attribute data from an XML metadata catalogue. In MetadataUrl, you can define the general path to the XML metadata catalogue. 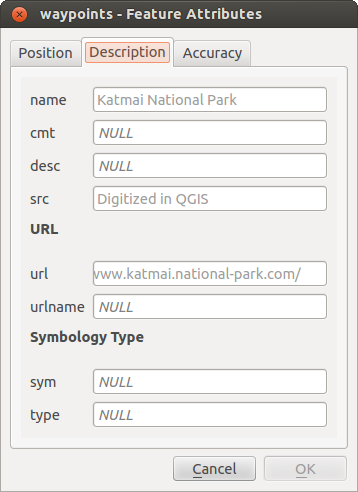 This information will be saved in the QGIS project file for subsequent sessions and will be used for QGIS server. 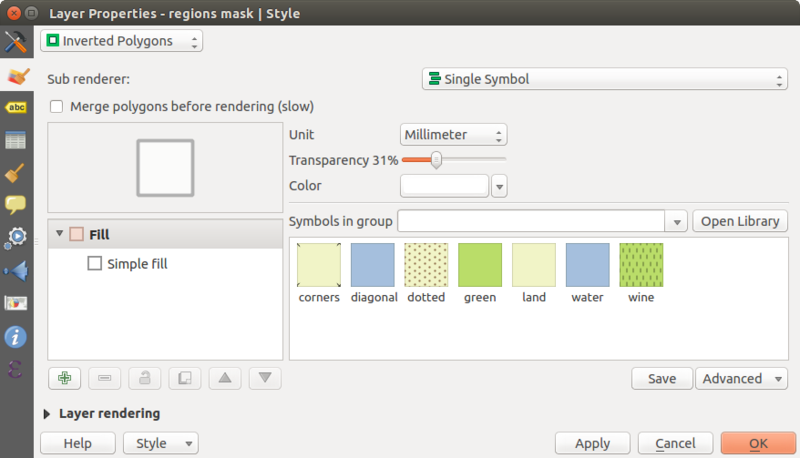 When a layer is added to map canvas, QGIS uses by default a random symbol/color to render its features. You can however set a default symbol in Project ‣ Properties ‣ Default styles that will be applied to each newly added layer according to its geometry type. A style stores any information set in the layer properties dialog to render or interact with the features (including symbology, labeling, action, diagram... settings). 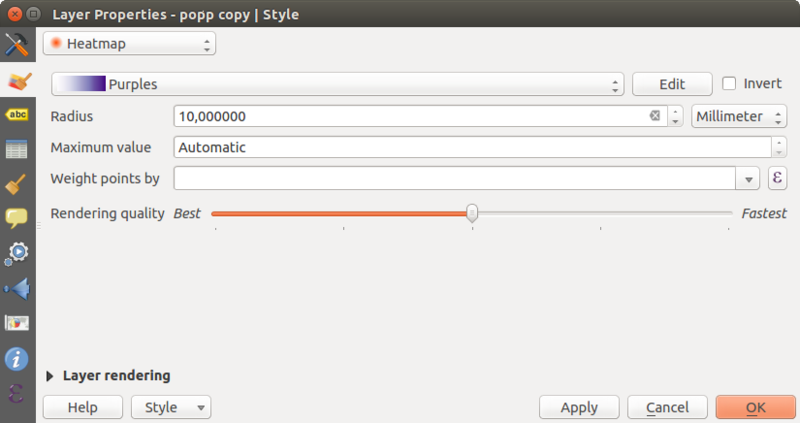 Add: A new style is created using the current options. At the bottom of the Style drop-down list, you see the styles set for the layer and the active one is checked. Once you have more than one style defined for a layer, a Remove Current option can help you delete those you no longer want. Right-click on the layer in Layers Panel to add, rename or remove layer style. You can also edit feature symbols. While these styles are saved inside the project and can be copied and pasted from layer to layer in the project, it’s also possible to save them outside the project so that they can be loaded in another project. 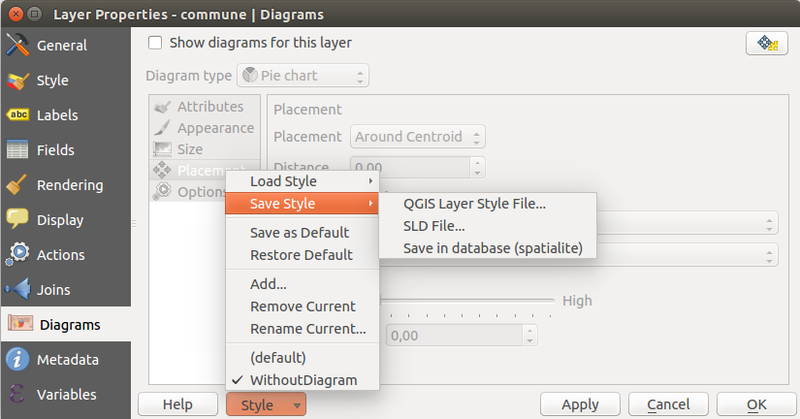 Clicking the Style ‣ Save Style saves the symbol as a QGIS layer style file (.qml) or SLD file (.sld). SLDs can be exported from any type of renderer – single symbol, categorized, graduated or rule-based – but when importing an SLD, either a single symbol or rule-based renderer is created. That means that categorized or graduated styles are converted to rule-based. If you want to preserve those renderers, you have to stick to the QML format. On the other hand, it can be very handy sometimes to have this easy way of converting styles to rule-based. If the datasource of the layer is a database (PostGIS or Spatialite for example), you can also save your layer style inside a table of the database. 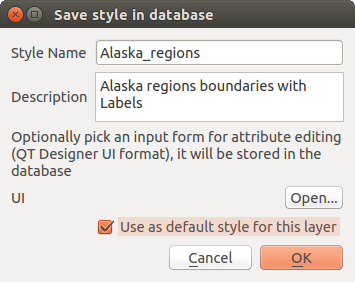 Just click on Save Style combobox and choose Save in database item then fill in the dialog to define a style name, add a description, an ui file if applicable and check if the style is the default style. You can add several style in the database. However each table can have only one default style. 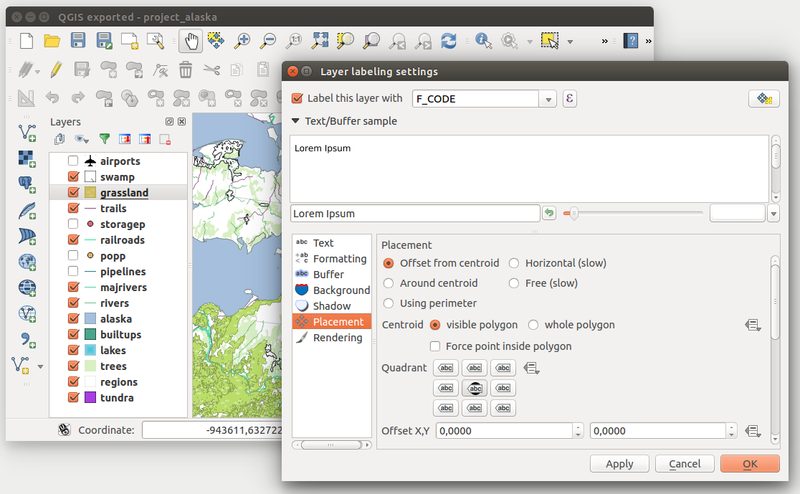 When loading a layer in QGIS, if a default style already exists for this layer, QGIS will load the layer and its style. After you modified the layer style, you can Save as Default, creating a new style that becomes the default one or Restore Default style if you’re not satisfied.